Was amazed to find out that Tuna gets low priced from the supermarket here last Friday, would you believe it comes as low as 4.50 Qatar Riyals per kilo? Well maybe it’s not as classy as with the oversized quite expensive yellow fin tunas in Gensan but you can choose from medium to large sizes with same price here. While people were ordering from the fish vendors in volumes I opted to buy some but actually don’t know what to do with it. 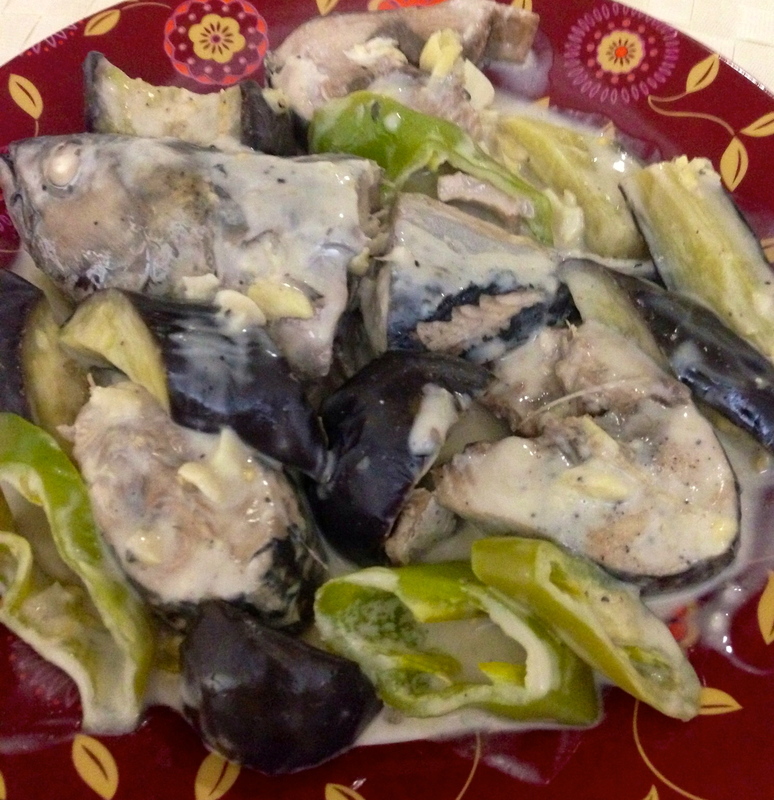 Coming across some tuna recipes from the net, Adobong Tuna caught my attention and decided to prepare it for dinner but with a twist from the usual adobo in soy sauce. Combine water and vinegar in deep pan and bring to a boil. Add the fish and the remaining ingredients except for the chili finger & coconut milk. Simmer, when liquid reduced to half put the chili finger and coconut milk last, let boil for at least a minute. Serve hot with steamed rice. Share & enjoy! Finally, I’ve made it! It was a week ago when my son asked me to cook suman (he actually remembered the one that Lola Juling used to gave him the last time we’re home). I was begging him to eat biko instead but he wants the unsweetened version of suman wrapped in banana leaves. In as much as I wanted to cook it right away I waited for Friday (our market day) to look for those precious leaves. I was lucky enough to have found the last bunch of almost wilted banana leaves in the supermarket (a rare find I must say) and the next day I got to work on it before it gets really dry. Suman is actually an inexpensive and a very easy rice rolls recipe to make, most of the flavor comes from the banana leaf wrapping thus, no artificial flavoring is needed. When I think of this delicacy I would miss my grandma. I grew up seeing here making varieties of banana leaf wrapped suman and sell it for a living, just like “lidgid” or the grated cassava or (camote)sweet potatoes, suman sa lihiya and suman moron but the most memorable way she used it for were these sticky (glutinous) rice of which is my favorite. Also on special occasions like New Year, Christmas and fiestas during my childhood, these delicacies were always present and many would say that my grandma was one of the best suman maker in town. So here’s my take on making Suman for the first time and am glad I finally did it! By the way suman is best serve with sugar, latik, sweetened grated coconut (bukayo) or ripe mango, you can choose whatever suits you good from those but personally I prefer ripe mango if available. 2 cups glutinous rice, soaked in water for 2 to 3 hrs. Remove the water from the rice by straining, then place it in a pot with the coconut milk and salt. Bring to a boil, stir and immediately lower the heat to the lowest setting and stir occasionally to minimize rice from sticking on the pot. Let is simmer for 20 minutes then turn the heat off. Don’t open the pot, leave it for another 15 to 30 minutes to finish cooking and to cool down. For the wrapping, pass the banana leaves over an open flame very quickly. This process will release the aroma of the leaves and will make them soft and flexible. Cut the leaves by making equal number of small pieces or depending on what size of roll you want your suman. Wrap the rice as tight as possible and fold the sides. Tie two pcs. 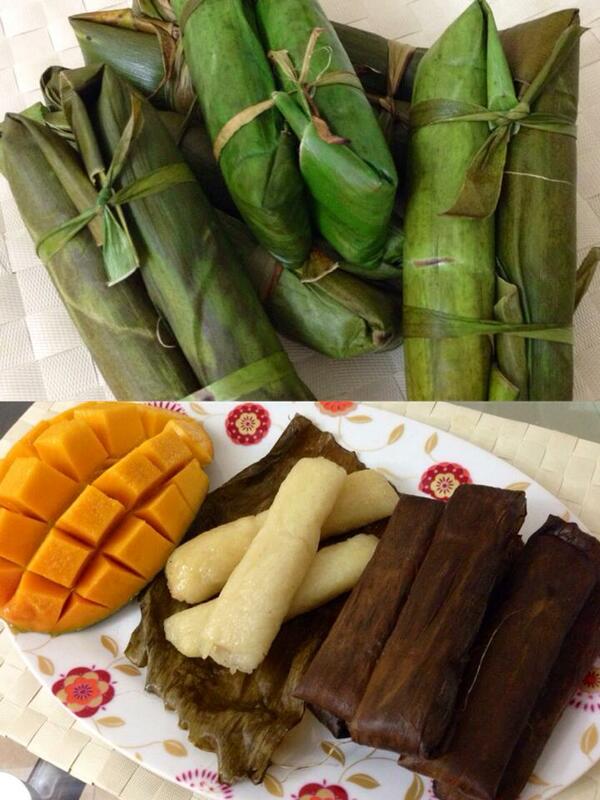 of suman with folded sides inward (as shown on the picture) or you may wrap 6 pieces or more again with a larger piece if you still have extra leaves to serve as double protection. In a steamer, stack the suman and steam for around 30 minutes to one hour over boiling water. Make sure they are tender before removing them from the steamer. Allow it to cool before unwrapping so that it will firm up. Serve with sugar, sweetened grated coconut, latik or ripe mango. Share & enjoy! Zucchini or marrows as they call it here is a dark or light green squash vegetable, usually grown abundantly in summer. I always find huge pile of it in supermarkets here which made me curious of its taste and preparation. Sprinkle some salt and pepper on the shrimp. Let stand for 10 minutes. Pan-Fry the shrimp for 1 minute on both side. Mix in onions and stir. Add oyster sauce, soy sauce and maggi magic sarap. Stir and then cook covered for 2 minutes then add water. Put-in the zucchini and bell pepper, add salt as necessary. Stir, and then cook for 5 minutes until most of the liquid evaporates. Transfer to a serving plate. Serve hot with steamed rice. Enjoy! Squeeze lemon all over the fish, and sprinkle salt and pepper. Mix all the chopped tomatoes, onions & ginger, season with maggi magic sarap. Lay aluminum foil (dimension around 8 x 12 inches or just enough to wrap the fish) Layer on it the tomatoes, onions and ginger mixture. Place on it 1 portion fillet and top the fish with the tomatoes, onions and ginger mixture. Fold and seal the sides of the foil properly so it will be air tight. Do the same with the remaining two portions of fillet. Place over the grill and broil it for 15 minutes on each side. You can open to check if fish is well done. Place the fish with the foil on the serving plate. Serve hot with rice and soy sauce with lemon as dipping sauce. Enjoy! In a small bowl, stir together lemon juice, soy sauce, brown sugar, water, and olive oil until the sugar is dissolved. Season ﬁllets with garlic powder, salt, and pepper. 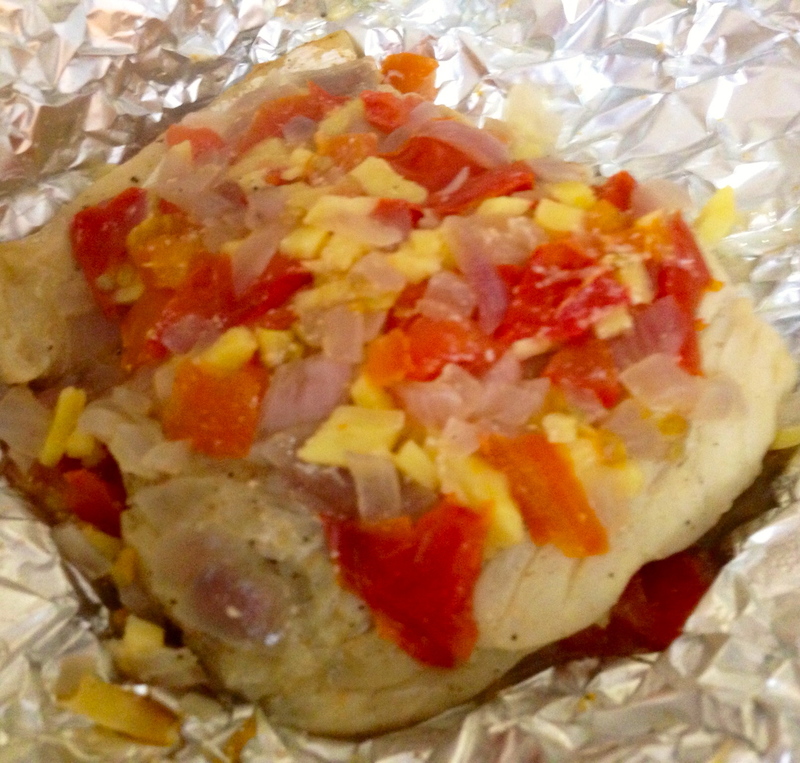 Place the lemon mixture and ﬁllets in a ziplock bag, and let marinate in the refrigerator for at least 2 hours. Preheat grill to medium heat. Lightly oil grill grate. 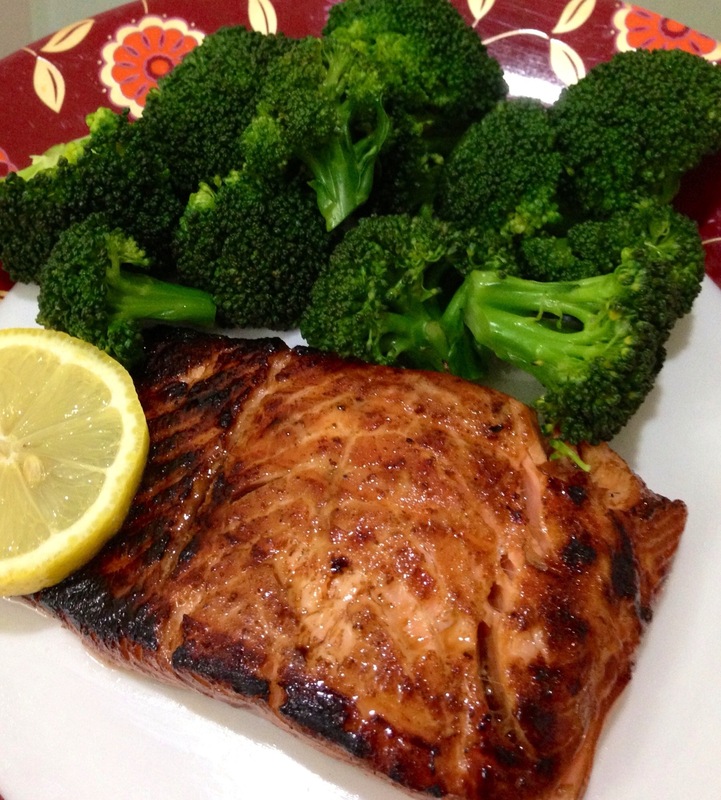 Place salmon fillets on the grill and cook for 6-7 minutes on each side or until fish flakes easily with a fork. Serve hot with side dish like steamed veggies and or steamed rice. Enjoy! Eid holidays came and gone, howbeit with the summer heat striking at it’s peak over here we didn’t think of going out for any outdoor activity. 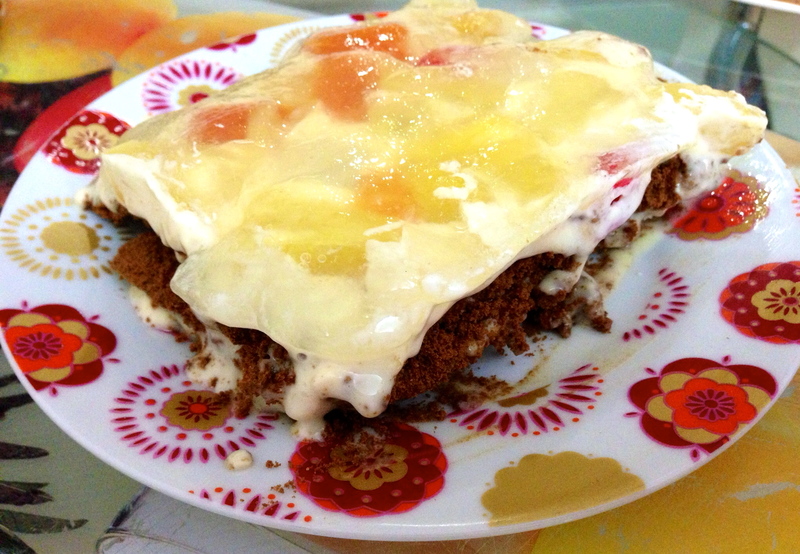 Yet staying home during daytime means cooking and preparing something cool and different like what i’ve got, the sweet and luscious no bake cake recipe, Crema de Fruta made of M.Y. San Chocolate Graham Crackers. 1 big can fruit cocktail (Del Monte). Drain and reserve the juice. Pour nestle cream and condensed milk in a mixing bowl. Whisk well until well combined. In large square container or pyrex dish, arrange graham crackers. Spread and cover them with cream. Repeat another layer and top with fruit cocktail; reserve the other half can of fruit cocktail for another layer (with fruit cocktail on top of the last layer). For additional toppings, dissolved gelatin powder in cold water. Simmer on medium heat, and add the fruit cocktail syrup. Stir occasionally until mixture boils. Let it cool for 1 -2 minutes. Pour the gelatin mixture over the graham crackers and fruit. Put in fridge, chill, serve and enjoy! Pork Menudo has been a special dish in my home country and that no parties will ever be complete without menudo but have you ever tried Chicken Menudo? 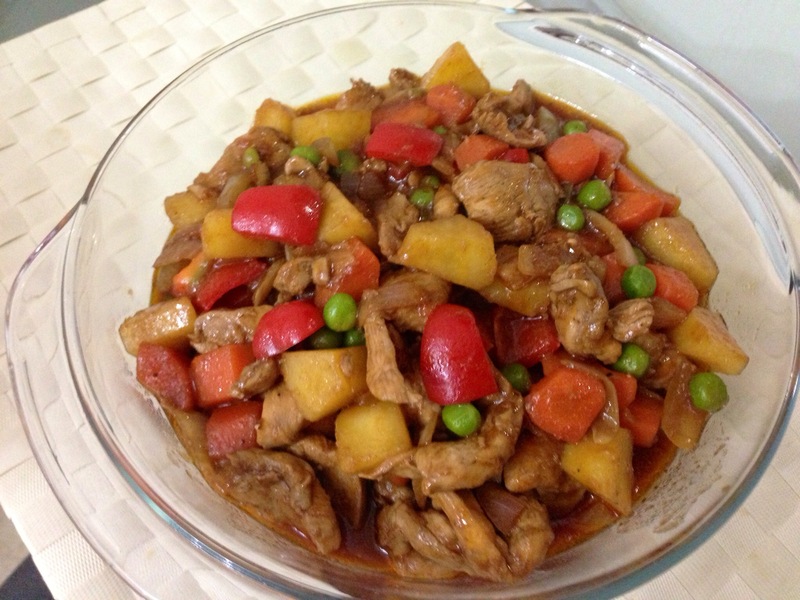 You can try this recipe of mine and forget about pork menudo. When you are living in a place like ours that you rarely encounter porky then you can think of an alternative to satisfy your craving taste buds of the dishes you’ve been missing. 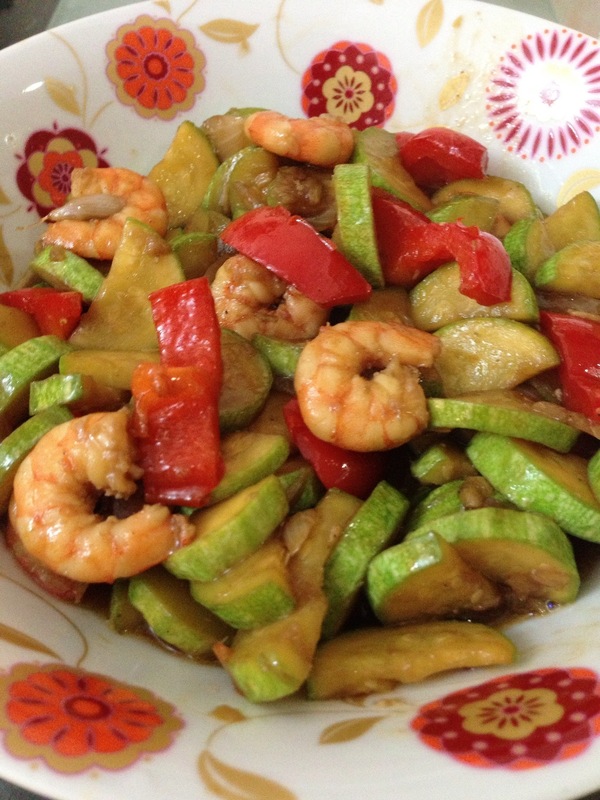 Start by mixing in a small bowl the lemon juice, soy sauce, tomato paste and black pepper. Mix well. Use this a marinade for your chicken, marinate for at least half an hour. Afterwards, heat a pan and pour the olive oil then start stir frying carrots and potatoes until edges becomes brown. When done trasfer in a plate and set aside. In same pan with the oil sauteé your garlic, onions and marinated chicken. Cover it and let it simmer in low fire for about ten minutes. Next add the carrots, potatoes, green peas and bell pepper continue stirring then add the tomato sauce. Pour in water, cover it and let it simmer for another 5 minutes. Add sugar, maggi magic sarap and salt to taste. Wait until the sauce thickens and turn off the fire. Hi everyone! I’m a stay at home mom with a 2 year old son to look after, domesticated as it seems but I'm not that busy as not to be able to maintain an internet presence. I love writing and sharing experiences whenever I get the chance to sit on my tablet. I have a lot to share here that I’m sure you can be interested of most specially on My Food Blogs featuring my very own recipes, though some of those are patterned from famous recipe books and internet sites I personally have tried the dish, modified the ingredients and cooking procedures to suit my taste and style. Also, some of those I’ve minimized the ingredients to make those dishes a budget friendly recipe to fit for those who want to practice a frugal way of living. I’m always thinking of making our future recipes as budget friendly as possible and easy to prepare as well, so please stay tuned! As cooking is my first love it’s a pleasure for me helping you out if you have some queries here.